Chinese Ten - thanoscardgamess jimdo page! This game is played with a standard 52-card pack. The number of cards dealt to players varies depending on how many are playing. For a game with two players, each player gets twelve cards. 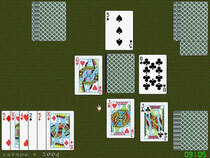 For a game with three players, each player gets eight cards. For a game with four players, each player gets six cards. After all the cards have been dealt, four cards are turned over face up from the remaining deck. The object of the play is to capture cards from the layout. A numeral card from Ace (1) to Nine captures another numeral card if their values add up to exactly ten - so for example Ace captures Nine, Nine captures Ace, Three captures Seven, a Five captures another Five, and so on. Tens and picture cards can only capture another card of the same rank: Ten captures Ten, Queen captures Queen, and so on. Suits don't matter for the purpose of capturing. At your turn you play one card from your hand. If it captures a card from the layout, you take both cards and place them face down in front of you in your pile of won cards; if not you leave it face up as a new layout card. Whether you caprtured or not, you next flip the top card of the face down deck face up. If this captures a card from the layout you take both cards; if not it remains in the layout. After you have played one card and flipped one card, whether you captured or not, the turn passes to the next player. You may play it against 1,2 or 3 opponents, with the first option being the most challenging (since you are dealt 12 cards). You select to play it between two Chinese French-suited decks.